When? 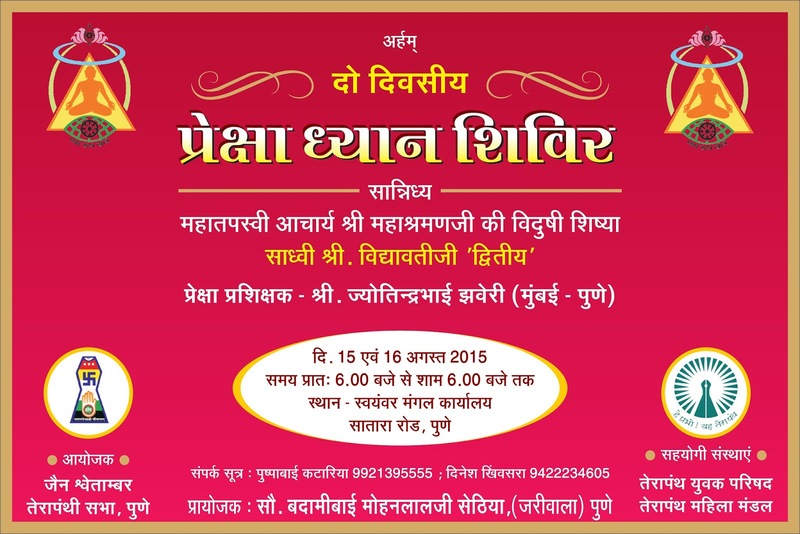 Saturday, 15 August and Sunday, 16 August. 6:00 a.m. to 6:00 p.m.
Where? 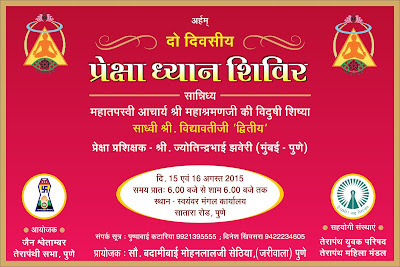 Swayamvar Mangal Karyalaya, Near Adinath Society, 695/3/27, Pune Satara Road, PUNE, Maharashtra, 411 037, India. For whom? Anyone who would Like to be healthy – not only physically but also mentally and emotionally. Age 15 – 70 years. Working Professionals and college students. What are the BENEFITS of investing two days? This meditation technique called PREKSHA DHYAN is ancient proven technique discovered in Jain scriptures, and practised by thousands of people. We are presenting from scientific angle without any bias of religion, cast or creed. Let us experience and learn the time-tested method – step by step -of doing meditation. Anupreksha (Contemplation), Leshya Dhyan (Meditation with Colours – Aura) and Kayotsarg (Complete relaxation with full awareness) will be explained in details with practical exercises. 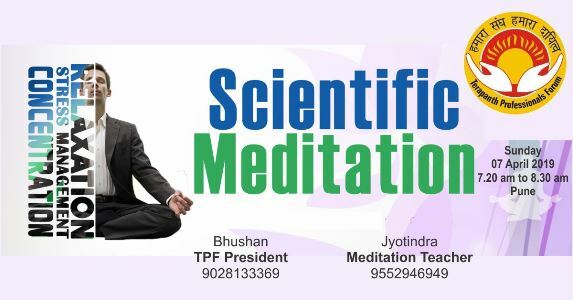 Happy feeling is: “Great to know that meditation has a proper scientific basis that can help healthy and happy lifestyle”.Saddest feeling after 17 August is: “I should have attended this Shibir”. Goal settings and how to use your subconscious mind to achieve it. How to improve concentration – important for professionals and students. Let us discuss about insomnia, hypertension, and health issues and challenges due to tension. Meditation techniques will be explained scientifically for the new generation. You always had a query but did not know who to ask, this is a good time to ask questions about meditation, and you have choice of understanding meditation scientifically or philosophically (or both)! In presence of disciple of great Jain Acharya Shri Mahashraman, the learned Sadhvi Shri Vidyavati ji (Dwitiya) and group. Training will be given by Jyotindra Jetha bhai Zaveri (Preksha meditation teacher with 15+ years of experience in teaching meditation). Two days camp is highly subsidised ₹ 250/- only. Blog post by Jyotindra Zaveri, Pune, India.